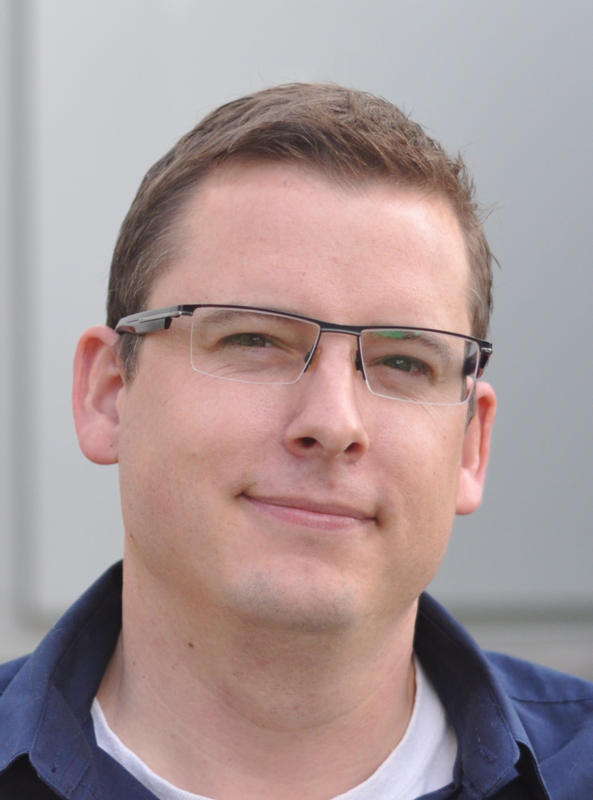 Why Use 2nd Order Integration Elements? 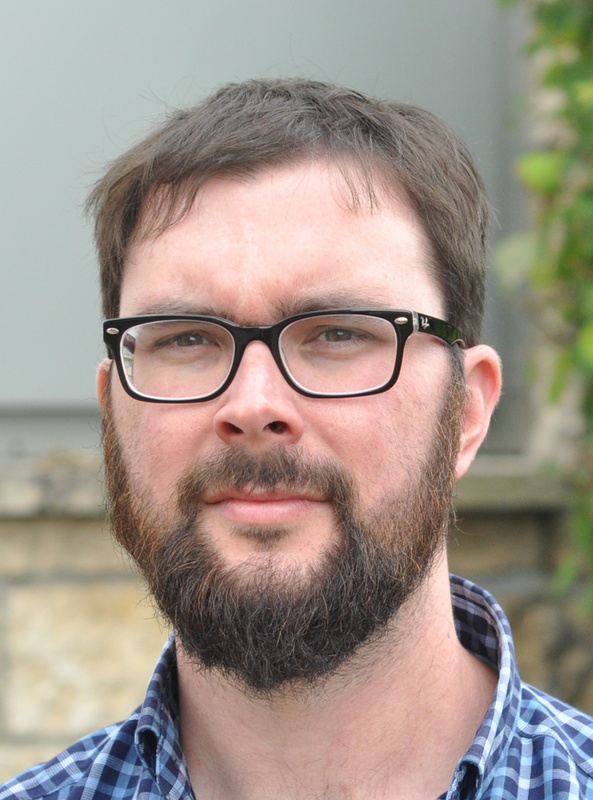 This is part of a series of articles that examines the ABSA (Alberta Boilers Safety Association) requirements on writing FEA reports. These guidelines can be found at: ABSA Requirements. The use of 2nd or higher order elements is one of the requirements. 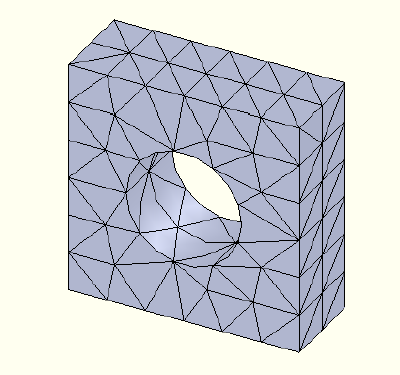 1st Order integration is found in the Mesh Options box under quality. The Draft option produces first order elements. High option produces 2nd order or higher – the default option. 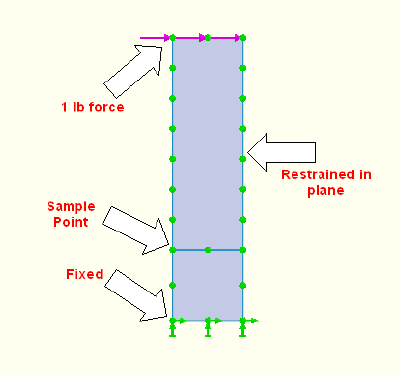 Integration beyond 2nd degree has to be chosen through the analysis properties window. 2nd order is the highest order available for shell elements. Which elements will produce better results for a simple tension load? The sample problem below is worked out in both 1st and 2nd order elements. 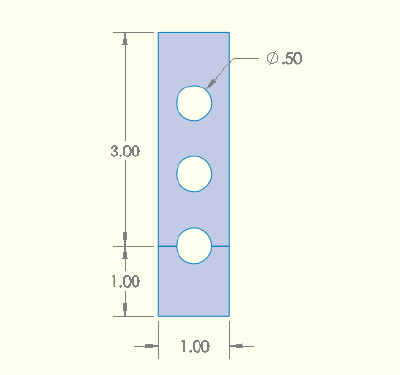 The model – a bar 1″ wide x 4″ long – it is split at 1″ to make a sampling point. The bottom is fixed and a 1lb tension load is applied to the top. 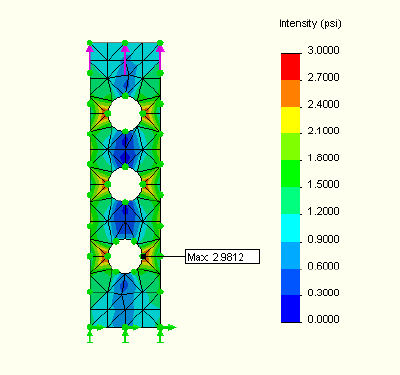 The model is meshed at 1″ thickness – a 1 psi stress is expected. 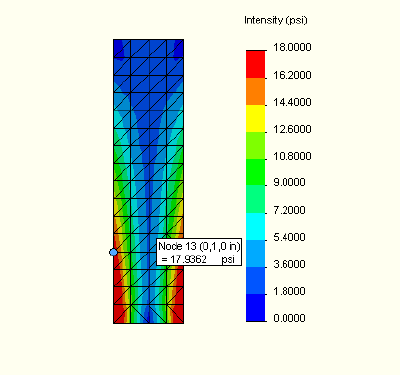 Stress Intensity plot for 1/8″ 2nd order elements. 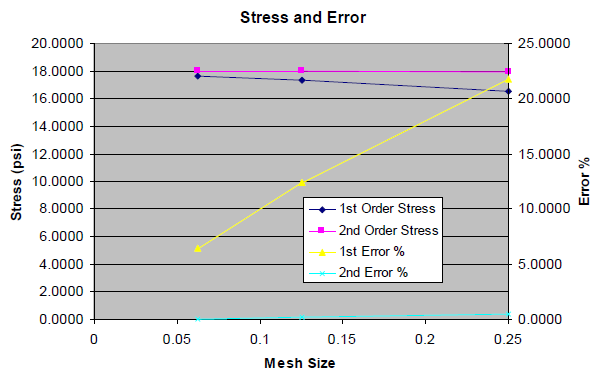 Graph of stress and error plot for the sample point. The stress values are practically identical; however, the 1st order elements have a much higher reported error level. 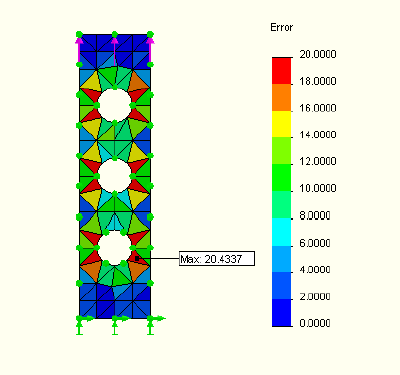 For this problem with a simple stress distribution, both the 1st and 2nd order elements produce excellent results as the mesh changed from 1/4 to 1/16″ size. 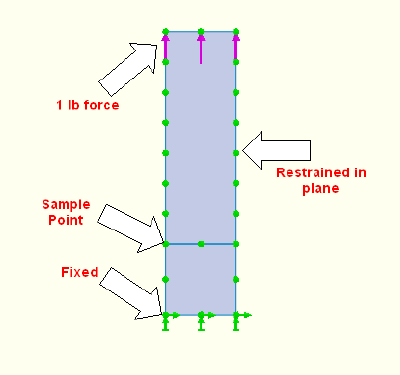 Using the same model from sample #1, the 1 lb tension load is changed to a 1 lb sideways or bending load. The moment of inertia is bh^3/12 = 1/12 in^4. 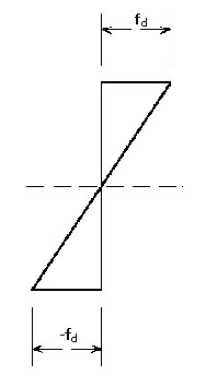 The distance from the neutral axis is 0.5″. The moment at the sample point is 3 in*lbs . 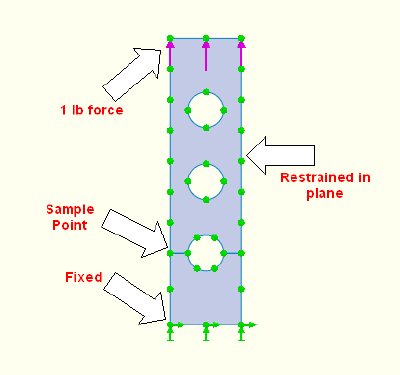 The expected stress at the sample point is Mc/I = 3*0.5/(1/12) = 18 psi. 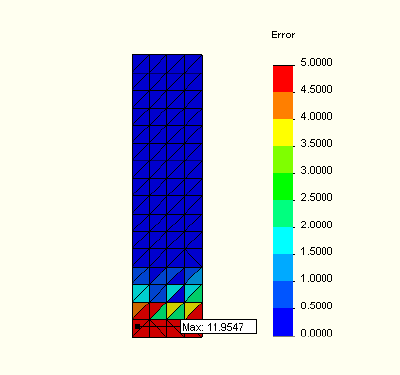 Error plot for 1/4″ 1st order elements. 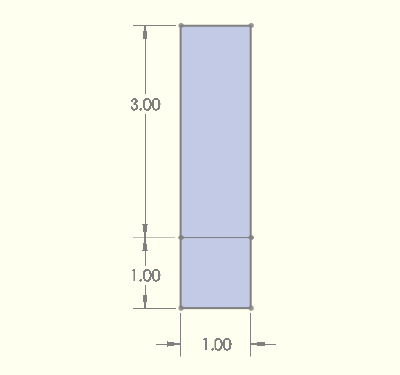 Stress plot for 1/4″ 1st order elements. 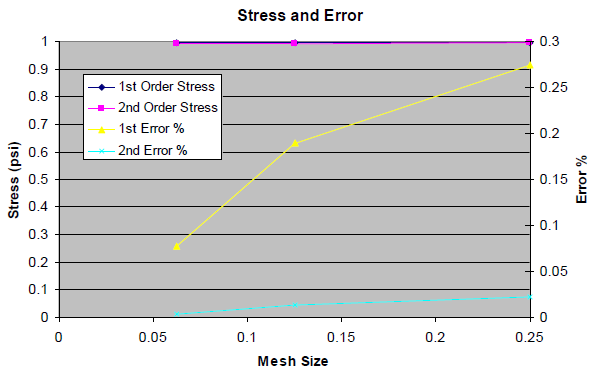 Graph of stress and error plot for the sample point. The First order elements have much higher real and reported error levels. The stress pattern in this bar is a simple linear distribution – but the 1st order elements do a lousy job of representing it. The second order elements did a good job, even at the coarsest mesh size. The reported error in all cases is much higher than the real error. For example the reported stress for the 1st degree elements at 1/4″ mesh is 16.5131 psi, theoretical stress is 18 psi. The real error is 8.3%, but it is reported at 21.8%. This over estimation is true for all the reported errors. 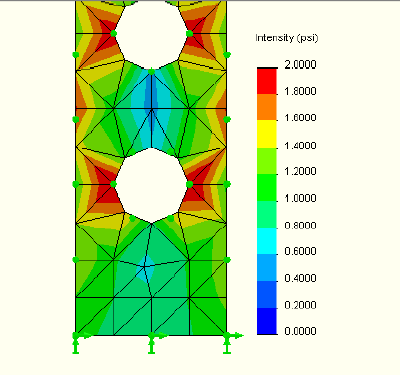 Simple uniform or linearly varying stresses do not often show up in real world FEA problems. 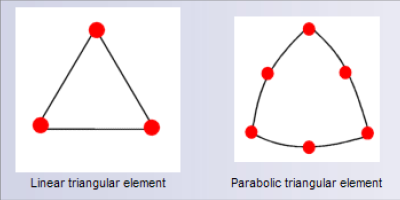 How do the 1st and 2nd order elements handle more complex stress patterns? The bottom is fixed and a 1lb tension load is applied to the top. 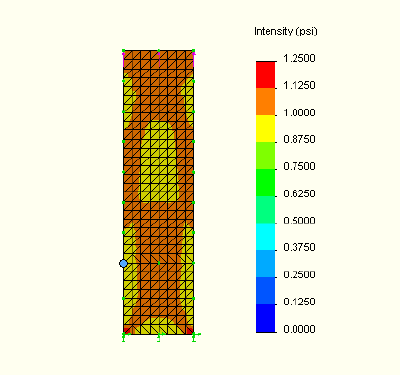 The model is meshed at 1″ thickness – a complex stress pattern is expected. 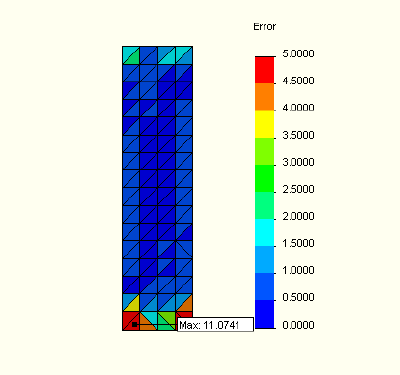 Stress and Error Results – Degrees of freedom of the models are added. 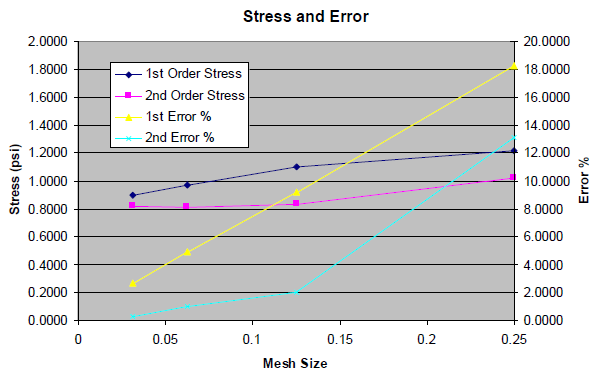 Graph of stress and error plot for the sample point. It is highly recommended to use the High quality option for final results and for models with curved geometry. 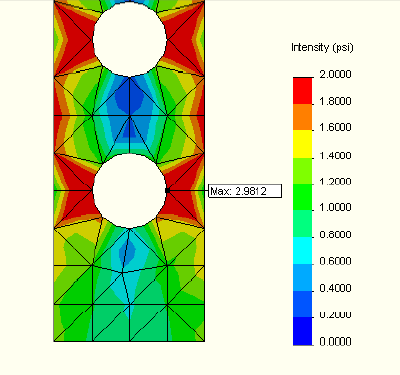 Draft quality meshing can be used for quick evaluation. The degree of freedom of the model is related to the computer resources required to solve the problem. 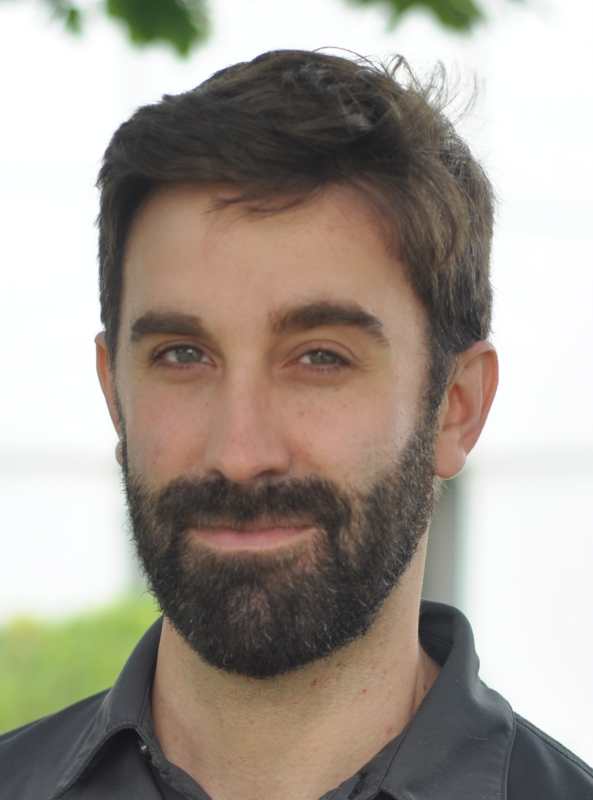 In this case, the 1st order model did not reach the result with a DOF of 18,000, but the 2nd order study got there by DOF = 4,800, a much better use of computer resources and users time. The same mesh quality issues apply to 3D as to the previous 2D studies. Here is a part with a round hole. 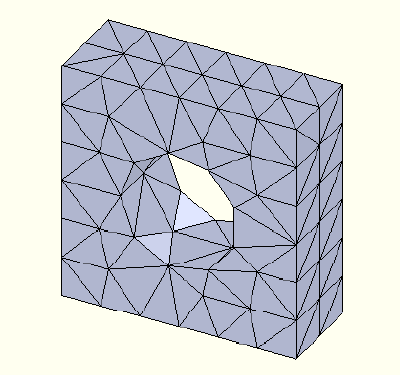 With a coarse mesh size, the 1st order model only slightly looks round. The second order results look much better. Because 2nd order elements do a better job of capturing the surface details. Because 2nd order elements do a better job of calculating complex stresses. Because 2nd order elements require fewer computer resources.